Idle VMs – Due to timer interrupts on idle VMs it can cause more overhead than when the VM is in use. CPU Affinity – You may receive a positive impact on performance for the virtual CPU that is pinned to a physical CPU using affinity, however this can cause a performance issue on the rest of the system as the scheduler must try to work around the affinity in order to balance the load. It is strongly advised to not use CPU affinity. Host CPU used – the amount of time that the hosts physical CPU was used erring that sampling period. irtual machine CPU used – the amount of time that the virtual CPU was actively using the physical CPU during that sampling period. Virtual machines that are utilizing virtual SMP can have their information displayed as an aggregate of all virtual CPUs within the virtual machine or per virtual CPU. Virtual machine CPU ready time – the amount of time the virtual CPU was ready but could not get scheduled to run on the physical CPU. Virtual machines that are utilizing virtual SMP can have their information displayed as an aggregate of all virtual CPUs within the virtual machine or per virtual CPU. It is important to understand the differences between the information gathered through the vSphere client and esxtop. The vSphere client information is gathered utilizing 20 second intervals where esxtop information is gathered using 5 second intervals. It is always important to normalize the values for comparing the output from these two monitoring tools. Only two counters at a time can be displayed in the chart. The virtual machine object shows aggregate data for all the CPUs within the virtual SMP virtual machine. The numbered objects tracked the performance of the individual virtual CPUs. If you see a short spike in the CPU used or CPU ready that will normally indicate you are making good use of your host resources. If both values are constantly high the host is probably overcommitted. The values to watch for negative performance would be above a 90% for the CPU used to value and a CPU ready value that is above 20%. Do not forget that the time values are different between the different tools used to monitor the CPU values. If you are monitoring a physical number you will need to know the sampling time in order to figure out the percentages involved. The #1 Warning sign is Ready Time and as expected this latency can affect the performance of the guest operating system. 2000ms or higher indicates contention issue. 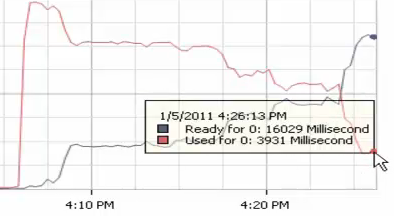 The below picture shows an example of a VM with inverted usage compared to Ready Time. The #2 warning sign is a high used value which can be determined by host CPU used or VM CPU used. This is not always an indication of poor CPU performance. You may wonder why! Keep in mind this is not a physical CPU meaning that what the VM is using does not always indicate that the host is maxed out nor does it always indicate you need more vCPUs. It may just be telling you there is high utilization which is a good thing! Press s – prompts you for the delay between updates, in seconds. The default value is 5 seconds and the minimum value is 2 seconds. Press V – that is a capital “V”. Displays virtual machine instances only. Do not confuse with the lowercase “v”, which is to view the storage virtual machine resource utilization. If you need to switch back to CPU utilization then type the c.
Press e – toggles whether CPU statistics are displayed expanded or unexpanded. The expanded display includes CPU resource utilization statistics broken down by individual worlds belonging to a virtual machine. All percentages of the individual worlds are percentage of a single physical CPU. Thank you for instructive post.